I recently finished a business book, which not to brag, is a pretty big deal for me. Just finishing a book, not the business part. But the fact it was a business book is important and has my mind spinning about how I interact with people and help our readers interact with teenagers. The book, Never Eat Alone by Keith Ferrazzi, is essentially a networking book. While that sounds stale and uninspiring, the motivating force behind his book and world class networking skills is what has got my head spinning – generosity. Now, I’m probably a few weeks late on the generosity post, but this goes way farther than presents. Ferrazzi posits any relationship and connected group of relationships (a network in this case) is best when done from a standpoint of generosity. That is, when seeking out a new relationship or even finding someone who can help you must start with what you can do for them. This seems upside down (which as I’m getting older seems to be where all of the good stuff is), but it makes a lot of sense. If I’m seeking out someone who can be of help to me, I will likely get that help much more freely if I have something to offer them – especially when it comes to people of influence. Everyone is wanting something from them, but if you have something you can offer them that is helpful and timely, they might choose you to build a relationship. Reading this book also got me thinking about another highly influential book in my library – Hurt: Inside the World of Today’s Teenagers. Dr. Chap Clark did a research study at a large California high school to get a reading on teen culture as well as how they interact with adults. The book is stunning because it paints a rather grim picture of adolescents really being on their own when it comes to adults. What Clark dubbed “The World Beneath” encapsulates a hidden subculture of teenage life where teens live and function without the help and guidance of loving adults. So, why are there no adults? Dr. Clark theorizes that since the mid 1960’s, adults have increasingly withdrawn from teenagers and become more protective of what they have. Institutions like public schools, civic organizations, and even churches have become adult institutions that teenagers have to exist within. Fewer and fewer adults interact with teenagers for the joy of doing so. For Dr. Clark, a lot of adults have trouble relating to teenagers in a way that is not corrective or directive. There is a lot more to this book than what I am describing, but suffice to say it made an impact on how I interact with teenagers. I want to be someone who a teenager can see as a safe place to talk, think, explore. I try my best to help them think and encourage them to make a good decision based upon what they know. I don’t walk in their shoes. I don’t know what they go through. But, I can help them think. And that brings be back around to the generosity stuff. I believe if we start from a stance of generosity when we work with teenagers, our relationships will be so much more robust. But, we need to think a little more about what they need. And, that is where this generosity stuff gets good. If we are willing to give of our time, our resources, our experiences, and our people, what an amazing impact we could have. If we were generous with patience and grace (both of which teenagers need in abundance), we would stand out as someone who could be trusted. You see, teenagers need more than your advice and direction. They need your generosity. 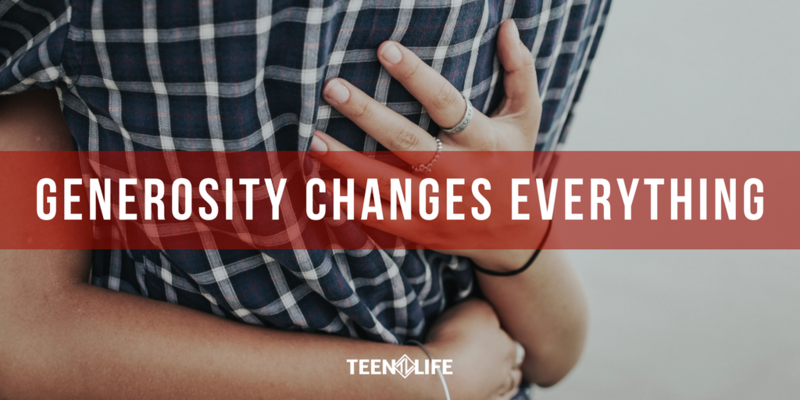 What would it look like to be more generous with a teenager in your life?